This is the first beer that I believe falls into the category of one of the harder countries to find. When I saw this at the beer store I thought fantastic, a normal style beer from one of the countries I felt would have been the hardest to find. A Euro pale lager is one of the most commonly drunk styles of beer in Australia. Almost all the imported beers you can buy at Dan's are examples of Euro pale lagers: Heineken, Carlsberg, Stella etc. Most Eastern European countries make quite unusal styles of beer, so it was quite refreshing to find a nice normal beer from one of these countries. For example Finland produces a disgusting local brew called Sahti, really avoid at all costs. The label claim that this is Lithuania's most popular beer and after pouring this beer I can see why! This beer looks perfect, clear with a perfect big white head. The carbonation looks great, the head seems quite thick while still being brilliantly white. The colour is maybe a tad yellow for the style but otherwise a perfect example, of one poured from a bottle. Nothing special on the nose. This beer smells like all European lagers, grainy with some hints of fruit. There is alot of sweet malt (not what I was expecting) and some hints of spicyness. Slightly citrusy but nothing really of note. The bottle claims they use bitter aromatic hops but I couldn't smell them at all. This beer is very rich and malty for a lager. 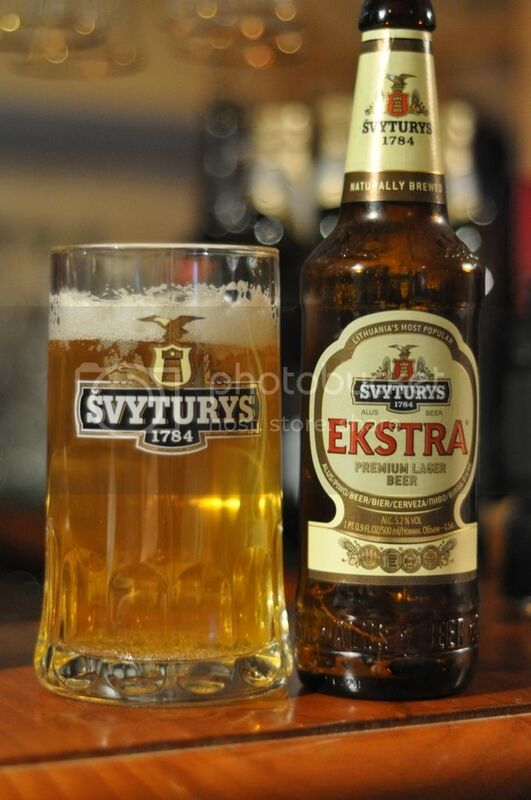 Svyturys have made a very interesting beer, as the aroma is quite sweet and inviting for a relatively cold climate, but also has a refreshing crisp bite to it. The hops mentioned on the back of this bottle are much more evident in the taste, and they are really high quality! I don't think they are Saaz hops but they are quite similar. The beer is very well balanced and highly drinkable. This beer has won some serious beer awards, after tasting it I can see why! I thought this was a fantastic example of a Euro pale lager. I could drink so many of these, it's incredibly refreshing while also having some substance to it. The flavours are rich but are balanced perfectly by the hops. This is a really good Euro pale lager, definitely worth a try if you can find it. I'll be getting more for summer.